The MASCOT MegaFlo trim effectively reduces the gaseous noise in control valves. MegaFlo design is a result of extensive research and engineering study. Various principles have been incorporated into the trim design allowing it to be used in varied applications like chemical/petroleum plants, refineries, power plants, process industries, nuclear industries and wherever a highly effective noise reduction valve is required. 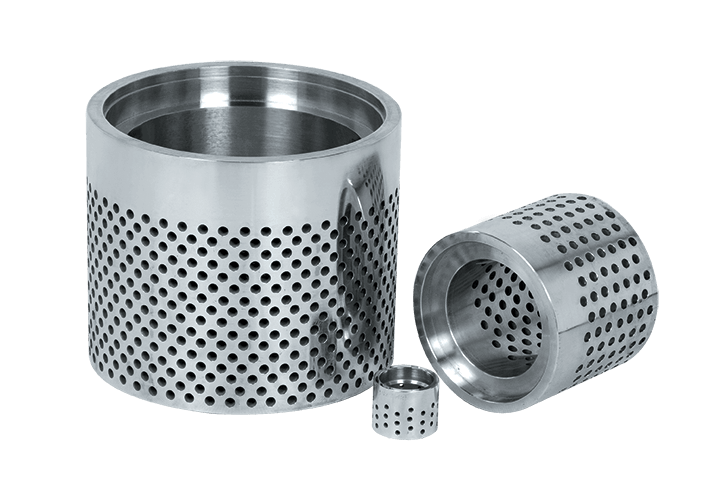 Staged Pressure Reduction through a series of carefully designed drilled hole cages called “Stages”. Generous Plug to Inner Cage (Stage) clearance which avoids galling and seizing. The Basics: In conventional single-throttling-point globe control valves, a vena contracta (point of greatest flow constriction) occurs immediately downstream of the throttling point. 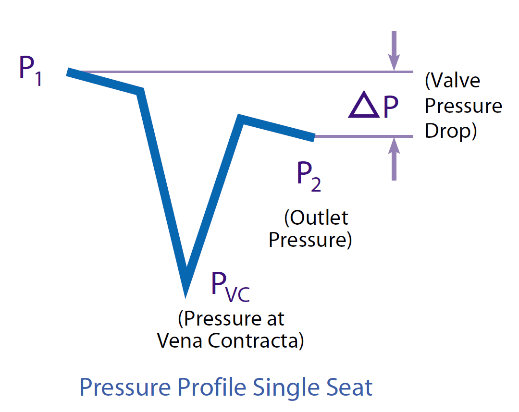 A simplified pressure profile of the fluid as it passes through the valve shows slight pressure losses in the inlet and outlet passages, and a substantial reduction of pressure at the vena contracta. Note that the overall pressure drop between the inlet and the outlet does not reveal how far the pressure may have dropped within the valve itself. The Problem with Gases: The problem becomes apparent by superimposing a velocity profile on the pressure profile, discussed above. For single-throttling-point control valves, with the sharp pressure reduction, the velocity will be greatly increased at the vena contracta. While considerable noise can be generated as velocities in the valve approach sonic levels, substantial noise can be generated even where inlet and outlet velocities are significantly less than sonic. 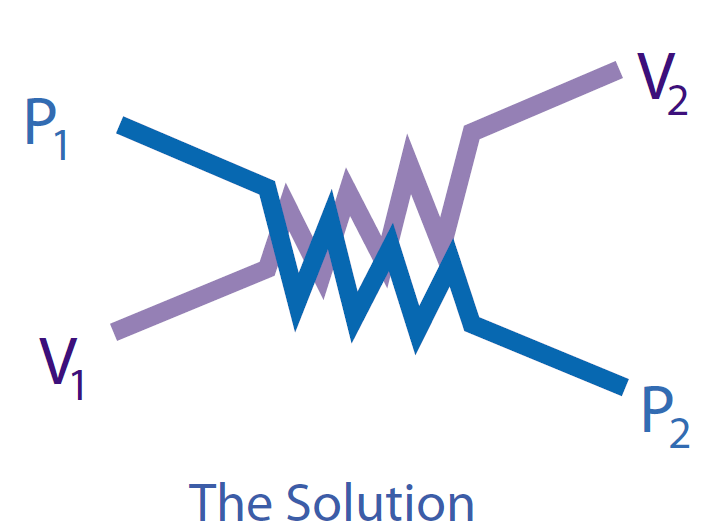 The Solution: The solution to the problem is to reduce the pressure from inlet to outlet gradually without allowing a sharp pressure drop at the vena contracta. 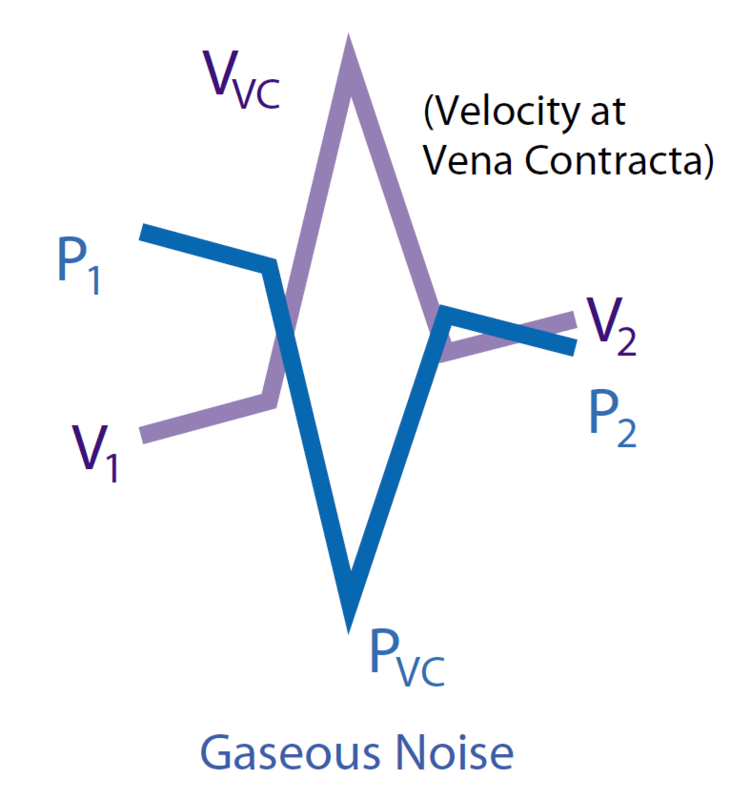 Thus, gaseous velocities are maintained at reasonable values throughout the valve and high noise levels are simply not generated. Also, by breaking the flow into many small flow streams, turbulent energy is reduced and dissipated. In addition, noise generated upstream is substantially blocked by successive stages.